We had booked our accommodation in Chillipilli Homestay in Hoskere Village at Mercara which was referred by a friend. It was our first experience of staying in a homestay and we thoroughly enjoyed it. On our way, when we were passing near Mysore in the evening, our driver asked us whether we would like to have a glimpse of Brindavan Gardens, which is just a few kilometers away from there. It was really a tempting offer. Since some of us had not seen the spectacular show we decided to take a detour to reach there. We spent about 40 minutes in Brindavan Garden and it was worth the time to watch the man-made beauty. Because of our unplanned visit to Brindavan Garden, we reached our Homestay in Coorg late by night. However, our hosts were very understanding and without any fuss they welcomed us with smiling face and served us food. We were given two rooms with the necessary basic facilities, and the food was awesome. They served us the delicious Coorgi food. 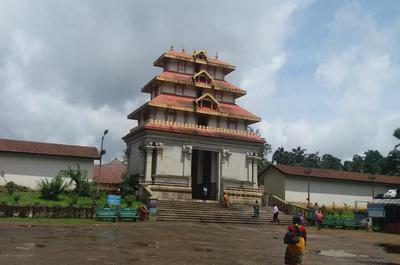 1) Sri Bhagadeshwara Temple at Bhagamandala, dedicated to Lord Shiva, located about 35 kms from Madikere town. The Triveni Sangam is here - the confluence of three rivers namely Kaveri, Kannike and Sujyoti. 2) Talacauvery, the origin of River Cauvery, at the foot of Brahmahiri Hill. It is a popular pilgrimage spot in South India. of coffee bushes, wild vines and creepers, located 10 km. 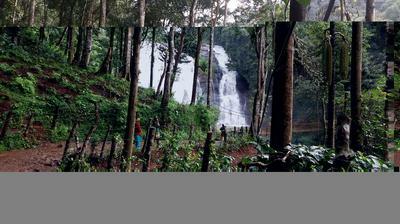 away from Madikere, cascading from majestic mountains of the Western Ghats, with misty clouds in the backdrop, it was a wonderful experience of watching the gushing waterfalls. 4) Dubare Elephant Camp - Located on the banks of River Cauvery, in Kushalnagar, it was an exhilarating experience of a boat ride to see the Elephants. 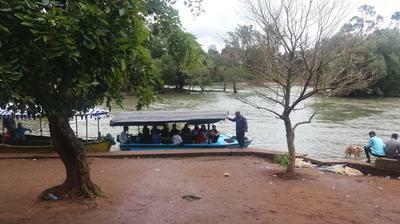 5) Cauvery Nisargadhama - It is a breathtaking and beautiful island off the state highway and a paradise for nature lovers. The island stretches across 64 km. and is nestled amid lush bamboo groves, thick foliage, and beautiful sandalwood and teak trees. The access to this beautiful place is via a hanging rope bridge,which is an exhilarating experience. My children enjoyed the adventurous sports like flying on the zip line from a tree-top. 6) Madikere Fort - This historic monument houses an Anglican church, a temple, a prison and a museum, including a vintage clock tower. 7)Omkareshwara temple- The Temple is dedicated to Lord Shiva, built in 1820, features spectacular Mumammadan architectural style with a centre dome and four corners with turrets and a beautiful pond at the centre with fresh water fishes. The temple is Similar to a Muslim dargah with a Linga installed near the entrance door. 8) Raja's Seat - It was once the favorite place of leisure of Kodagu kings. It is stunning to watch the beauty of the hill station sitting and standing at the steps there. It has a sprawling seasonal garden perched on a hillock that offers picturesque view of the sunset. 9) Bylekuppe - The Tibetan Temple called the Golden Temple, the second largest Tibetan settlement in India. Before leaving the homestay on the third day, we wanted to take a tour of their coffee estate, but we had to cancel it due to the rain. We made some new friends who too stayed in the same place and thrilled to meet them again and again at each of the places. Distance from Bangalore to Coorg - 260 kms. Enjoyed Onam and Deepavali. Hope you too had great celebrations during the time. Lakshmi, you really have a flair for writing travelogues! You make the reader travel with you! I savoured every line,and sent it to my grandchildren and daughter.Maybe it will entice them to take a similar trip next time they come. How are you? Deepavali and Onam greetings,though belated.